My family holiday to Germany was primarily a history tour of the country organised by my daughter. Of course I took my sketchbooks and dancing shoes but it was a whirlwind journey and not much time allowed for these dalliances. But I did slip some in when they weren’t looking. Berlin is a modern city, with plenty of street life and a vibrant art culture. Although bombed in the war there is a lot of history to be found – and we found a lot of it. 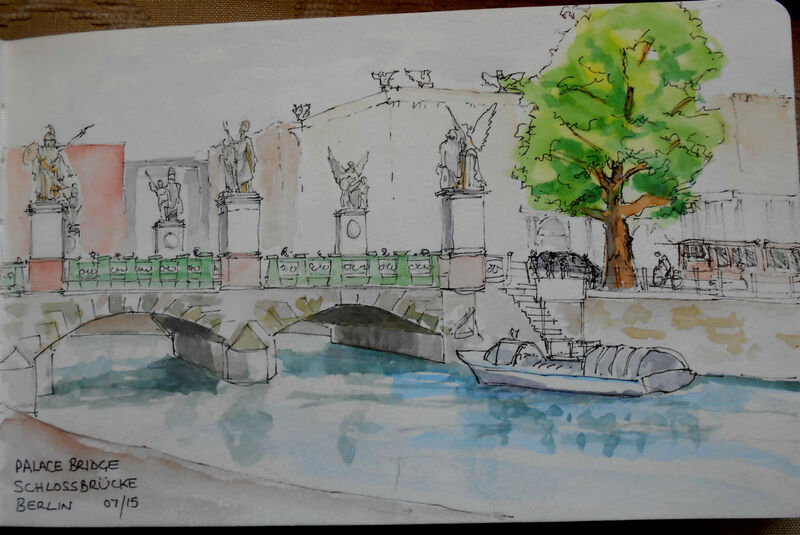 In 20 minutes while waiting for the river site-seeing tour to start, I sketched the view from the deck very quickly. To make up my lack of time and detail I added notes about the location afterwards. We were moored on museum island so there was lots to work out. Just downstream from this point is an outdoor theater and dance floor. I grabbed a couple of hours to see what was going on and notch up another new city to dance in. It was a slow start as I had turned up early and very hot but the location was stunning. 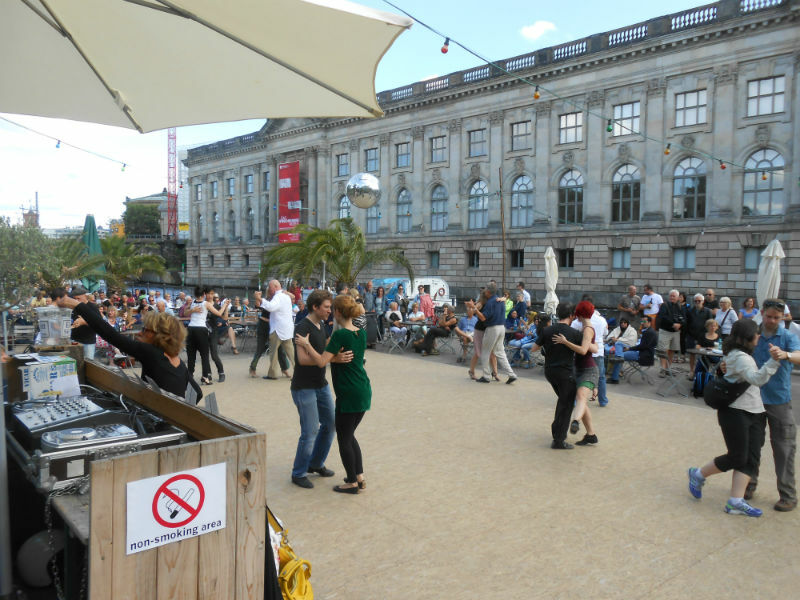 I quickly found some willing dance partners and had a wonderful time dancing in the sunshine, with an appreciative audience and lovely dancers. Some of the dancers were from Berlin but I did dance with other nationalities such as Russian and Argentinian. Wonderful. We moved around the city to visit the Reichstag, Brandenburg Gate, Checkpoint Charlie, The Berlin Wall and many other landmarks. With very little time I made some small pencil drawings where I could and found that the three I produced were all themed around Communism!? 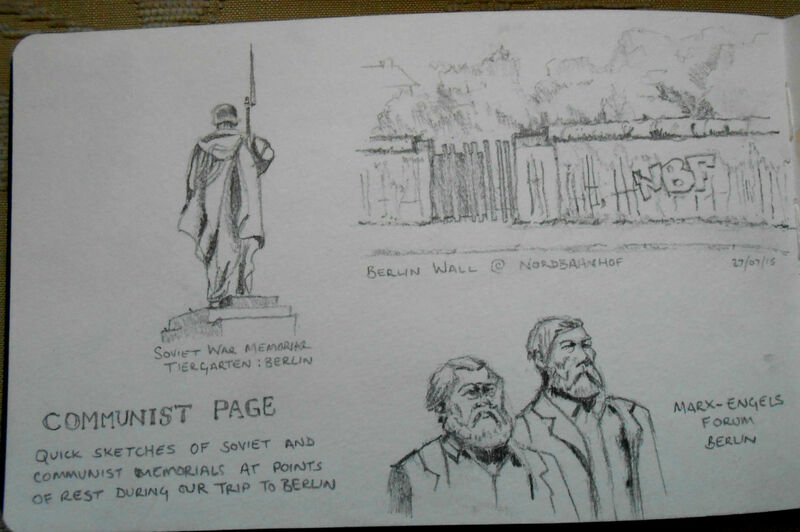 The Russian war memorial, The Berlin Wall and Marx/Engels (big beards) statues. I was using my small sketchbook for these, a Moleskin, with watercolour paper, and a waterbrush that I really like but I have difficulty getting the really deeper darks with. The next day with visited the Palaces and Schloss at Potsdam. Very beautiful and lots to see. We left Berlin on the fast train to Nuremberg. 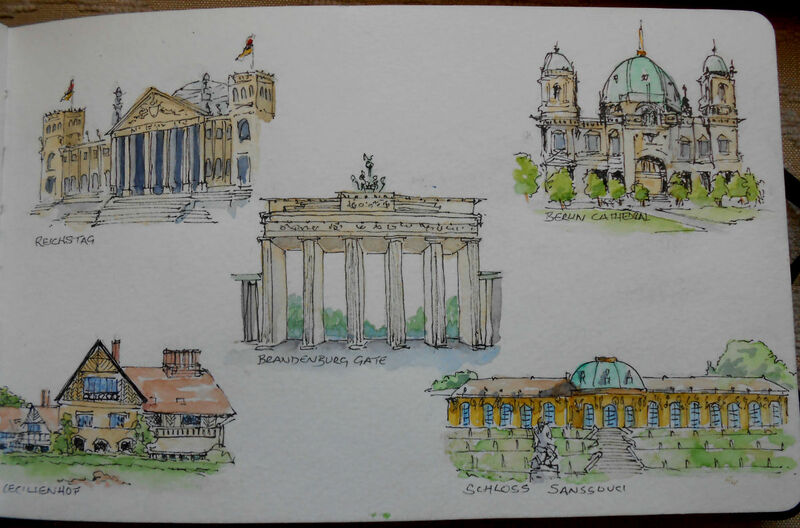 With 5 hours to spare I set about making a quick page of the main landmarks in Berlin and Potsdam, taken from photographs and tourist leaflets. I like this type of sketching as you can create a montage and personal memory of the trip. I’ve still to add the words and headlines (in traditional German typefaces) which I will update later when I’ve found time to draw them in. Reichstag, Berlin Dom, Brandenburg gate, Ceclienhof and Schloss Sanssouci, Potsdam. More of the holiday, drawing and dancing in later posts. Regarding the food mentioned in the headline – currywurst, frankfurters, german sausage – all tried and fine – once – but over time became a little tiring. I’m sure the Germans say the same about the food in the UK.